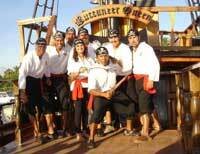 Board the Buccaneer Queen pirate ship in Cabo San Lucas and embark on an adventure ye shall never forget! This 96-foot tall ship has been featured in many commercials and feature films including Cutthroat Island, starring Geena Davis - the movie was filmed almost entirely onboard! On this sunset cruise, you'll be treated to amazing sunset views of Cabo San Lucas, El Arco (The Arch), Pelican Rock, Land's End, Lovers Beach, and more! You'll even have your photo taken at sunset in front of The Arch for a memory to treasure for years to come - available for purchase after the tour. This exciting voyage is full of raucous fun, including a pirate show that includes the ship being boarded by evil pirates and onboard duels, audience participation games, prizes, dancing, music, conga lines, and of course the all-important never-ending open bar. Let the margaritas and pina coladas flow freely as you enjoy the sunset over the Pacific, and all the fun and games. You may also enjoy the Buccaneer Queen by day with our Pirate Treasure Hunt. Daily from 5:45 PM to 8:00 PM (winter) or 6:00 PM to 8:30 PM (summer). 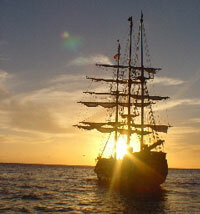 Sunset Cruise aboard the Buccaneer Queen Pirate Ship, Open Bar, Snacks, Pirate Show, Onboard Games and Prizes. Photos will be available for purchase. This is really an adult-oriented booze cruise, and isn't really targeted toward families though all ages are welcome. The daytime cruise is family oriented, however.